The word game genre is something that has only mildly intrigued me over the years. From raging at my older (and more expansive knowledged) brother over a game of scrabble as a kid to briefly binging on Words with Friends with my wife in the early 2010s, I’ve occasionally enjoyed spurts of these educational-ish gaming experiences. I would not consider myself a fan of this game type by any stretch of the imagination, however. 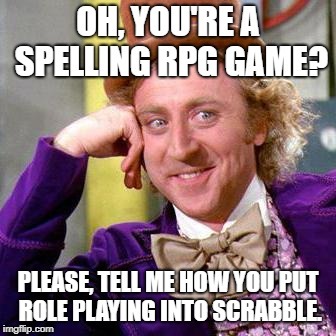 But tell me you’re putting RPG elements into a word game (heck, any game) and I’m freaking there, my friend. A few weeks ago, I decided to throw both Spellspire and Letter Quest Remastered (henceforth known simply as Letter Quest) on my wish list for giggles. In the event that they were to ever go on sale, I might consider getting one (or both) of them to check out. Fortunately for me (unfortunately for my wallet), discounts for both of them dropped last week! As a quick note, if you aren’t using SwitchRPG’s wish list system, DO IT! It will send you out reminders when games on your list go on sale! Or don’t use it if you want to avoid diarrhea of the wallet, but you will be missing out. Nonetheless, I snagged both titles and have played a decent amount of each at the time of this writing. Today, I’d like to give you a comparison of the two titles and hopefully some insight on a strange genre mashup that may or may not appeal to you. At a base level, both games are pretty similar. Each have you creating words from a limited pool of letters, comparable to Scrabble. 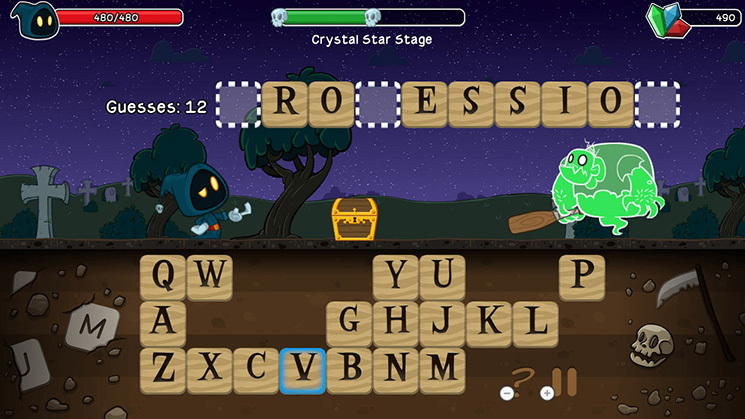 Unlike Scrabble, however, creating words deals damage to your opponents, and clearing a level completely of enemies allows you to move on to the next one. Items and equipment purchasable in the respective games’ shops allow a little more complexity to these systems, by adding different modifiers to your attacks and/or defenses. While both shops offer a decent selection of upgrades and consumables, I’ll have to give the medal to Letter Quest in this department due to its more robust offering overall. I also found it to be much more reasonable in terms of shop prices comparatively to Spellspire, which will be discussed in more detail later. Despite sharing base gameplay similarities, the actual loop of defeating monsters and traversing stages is actually executed a bit differently in both games. 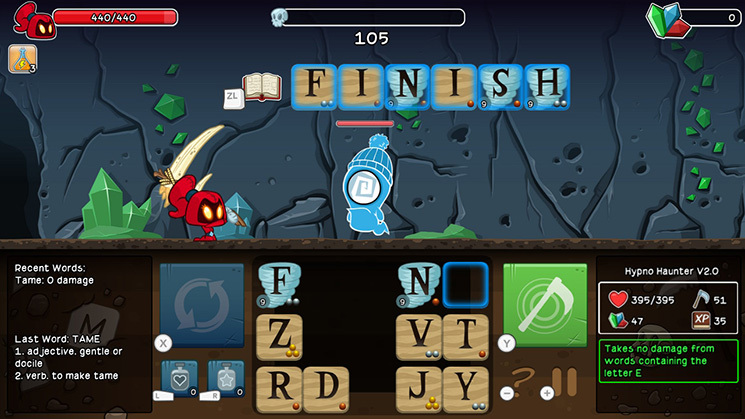 The encounters in Letter Quest play out in a turn-based fashion, while Spellspire resorts primarily to active time situations. Diehard spelling wizards will likely appreciate the more aggressive approach to gameplay that Spellspire offers, but it wasn’t for me. Letter Quest offers some timed challenges, but the main “story” mode is all about those turn-based encounters. I suppose the main thing to draw from this is Spellspire gives you no choice but to play a single way while Letter Quest offers multiple styles of gameplay through its additional stage challenges (unlocked after beating the level once). Spellspire has an additional unlockable challenge for each level, but I found these to almost always be the same thing (monsters do more damage and/or attack a +% faster than normal). Letter Quest shakes things up a bit by adding not only timed challenges, but also situations where you can’t use certain letters, or you have to clear the level with a limited number of words, etc. I found this, on top of the more methodical turn-based approach, much more enjoyable than what Spellspire had to offer. Both games handle the actual letter pools (chosen per level) differently. Spellspire gives you a selection and does not deviate from it throughout the entirety of the level. This allows the ability to quickly conjure variations of words like shine and shines in rapid succession. I would say that this is almost a mandatory feature, especially during certain encounters when you are really running against the clock to finish before dying. I honestly cannot imagine beating most of the levels if the letters you used were constantly being replenished by new ones. The letters in Letter Quest do change as you use them though, which is fitting given the slower pace of things. It can definitely get a little hectic once you factor that into some timed challenges though. 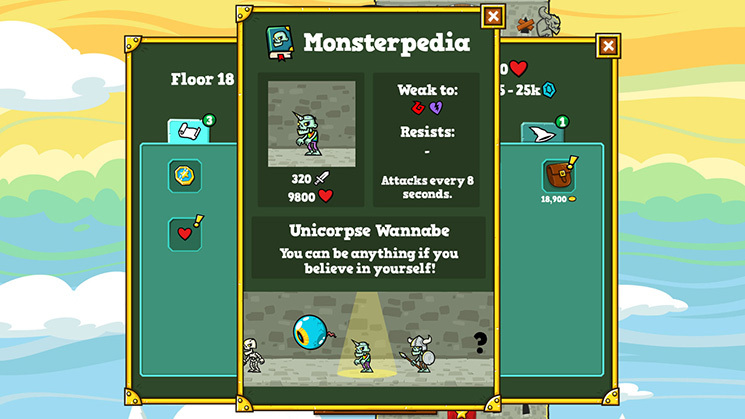 In addition, many of the letters the game’s enemies have abilities to break individual letters in certain ways, from poison (damages you AND the enemy if used), plague (causes afflicted letters to do no damage, spreading to other letters each turn) and more. Once again, I found myself resonating much more with Letter Quest’s design rather than the brute force mentality of Spellspire. I believe both games excel in the overall look and feel department. While the cutesy art style may not be for everyone, I thought they had a rather charming appeal. The heroes look interesting enough and the enemy designs are often unique and pleasing to the eye. Although there is nothing terribly memorable in the sound department, both games do a well enough job of evoking a sense of adventure in their respective worlds. Keep in mind that we’re talking about word games, not action games and that should temper your graphical expectations enough for them to deliver an adequate enough job in that avenue. In short, Spellspire requires an incredible amount of grinding from you while Letter Quest allows you to progress at a more continuous pace. I typically do not have a problem with grinding in games, but I felt like Spellspire was overly punishing to say the least. You will hit a certain point rather quickly in its 100 level offering where an enemy will literally one shot you until you’ve acquired better equipment and upgrades. This isn’t a problem in itself, but the way they handle it makes it that much worse. First, there is no real difficulty ramp up. It’s like going from 0 to 60 mph but skipping all the different speeds in between. You hit these walls numerous times without warning. The second issue lies in what was previously mentioned: the shop prices. 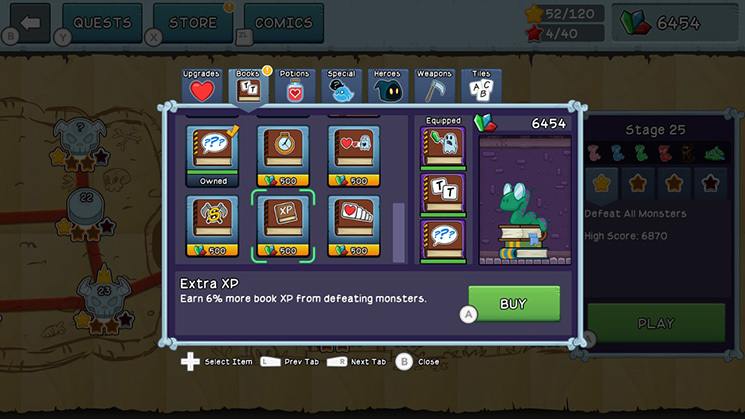 In the beginning, you can grind a handful of levels and acquire most of the upgrades you need. Shortly thereafter, things become so expensive it could take hours of the same levels to fully upgrade your equipment sets. Luckily, since the letter pools in Spellspire are randomly generated, it means you will always have a different experience each time despite playing the same levels ad nauseam. This can work in or against your favor though, and it can be very frustrating when lady luck turns a blind eye, giving you a horrible letter selection while laughing at your desperate attempts to form words. Couple that with the possibility of being one shot against stronger enemies and you have a concoction of grindyness that will not be some people’s cups of tea. I just think Spellspire would have benefited from a smoother difficulty curve and reduced upgrade costs, or both. As it stands, it plays a lot more like a free to play mobile game thats end goal is to coerce you into buying time-saving microtransactions. On the opposite side of the spectrum, Letter Quest handles progression almost flawlessly. Even though it has an arguably lower base difficulty due to its design, it still has plenty of challenges to be had after each level is completed once. Items and equipment utilize a fair cost-to-time ratio, and never feels like your upgrades are insanely out of reach. 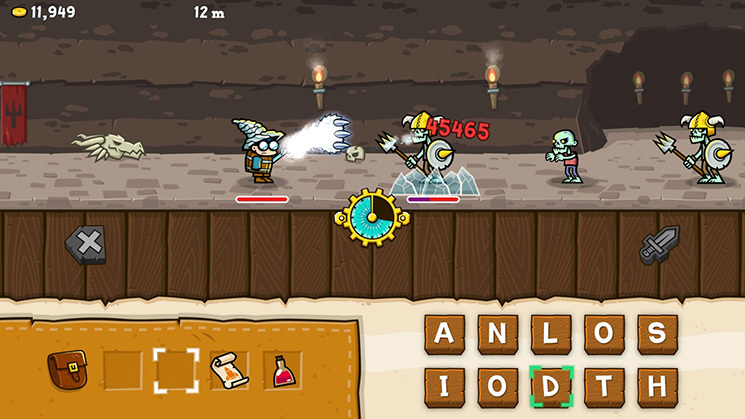 Most importantly, you don’t hit the difficulty brick walls like in Spellspire. Again, challenge is definitely here but not blatantly thrown in your face at seemingly random points. If I had to rate these games based on the SwitchRPG rating system, I would say that Spellspire is OK while Letter Quest is GOOD. Both games are certainly worth their asking prices, and can offer hours upon hours of content. While I much preferred the mechanics of Letter Quest, I imagine there is a subset of individuals that would take a liking to Spellspire. I’m actually glad that I chose to try these games, because they offer a lot more than what you can gather from screenshots alone. An “educational” RPG is something I would, in hindsight, probably not care for. But I can definitely recommend at least Letter Quest to those that are even slightly interested in a more unique take on an RPG title.